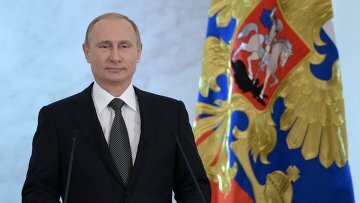 Russian President signs law protecting state institutions from online insults | Russian Legal Information Agency (RAPSI). MOSCOW, March 18 (RAPSI) – President Vladimir Putin has signed a bill on blocking of websites containing defamatory information insulting Russia's society, state symbols and state bodies into law. The document has been released on the official website of legal information. The State Duma, Russia’s lower house of parliament, passed the legislative proposal in the third and final reading on March 7. The upper house of parliament backed the draft law on March 13. Amendments would be made to the Federal Law on Information, Information Technology and Information Protection and the Administrative Offences Code. Under the provisions, Russia’s Prosecutor General and his deputies would be entitled to apply to the communications agency Roskomnadzor with requests to block websites breaking legislation. Moreover, the amendments envisage fines from 30,000 rubles (about $455) to 100,000 rubles ($1,500). In case the offence is committed for the second time, it is to be punishable with fines from 100,000 rubles to 200,000 rubles ($1,500 – 3,000), or administrative detention for up to 15 days. Repeated violations are to be punished with fines ranging from 200,000 rubles to 300,000 rubles ($3,000 – 4,500), or administrative detention for the same term.